Dyesol Limited and Merck KGaA have signed an agreement to collaborate in the development of electrolytes for use in dye solar cells (DSC). This joint development agreement is the precursor to potential future commercial arrangements with Merck to manufacture existing and next generation electrolytes for application in DSC. Merck is one of the world leaders in the development and production of ionic liquids which are key raw materials used in DSC electrolytes. Merck has patented intellectual property and vast know-how in the field of ionic liquids and is a leading supplier of materials for allied applications such as liquid crystal displays. Dyesol is the leading developer of DSC materials and solutions, having a broad portfolio covering DSC materials, product designs and manufacturing equipments. The first phase of the collaboration involves the development of new electrolytes, optimisation of electrolytes for high performance, refinement of material specifications to assure ultra long life, and scale up for volume manufacture. Dyesol will contribute the results of the past 12 years of testing on over 400 different proprietary electrolytes that has resulted in DSC with proven stability of well over 25 years in European conditions. Merck and Dyesol are, in parallel, discussing the terms for exploitation to ensure that Dyesol’s major corporate partners have secure lines of material supply and redundancy to underpin their investments in major DSC product manufacturing facilities, and that third parties worldwide have access to the best possible DSC electrolytes. As a result of this collaboration, both Dyesol and Merck will have the capacity and capability to manufacture DSC materials. "Photovoltaic renewable energy sources are showing increasing potential worldwide. The cooperation with Dyesol, the world leader in the dye solar cell sector, offers us the opportunity to leverage valuable potential in this attractive market. In addition, Merck already holds an excellent position due to its experience in the electrolyte market," says Dr Emil Aust, Senior Manager of Ionic Liquids at Merck KGaA. "When used as the main components of DSC electrolytes, Merck's task-specific ionic liquids, partly patented, make it possible to use both solid and flexible DSCs, thus enabling outstanding new applications in the future." For further information contact Viv Hardy at Callidus PR on +61 (0)2 9283 4111 or on +61 (0)411 208 951. Dyesol is located in Queanbeyan NSW (near Canberra) and in August 2005 was listed on the Australian Stock Exchange (ASX Code "DYE"). Dyesol manufactures and supplies a range of dye solar cell products comprising equipment, chemicals, materials, components and related services to researchers and manufacturers of DSC. Dyesol has subsidiaries in UK, Italy, Switzerland, USA, Korea and Singapore plus representatives and agents in Turkey, Germany, Abu Dhabi, Malaysia, Taiwan and Japan. The Company is playing a key role in taking this 3rd generation solar technology from development into commercial production. Merck is a global pharmaceutical and chemical company with total revenues of € 7.6 billion in 2008, a history that began in 1668, and a future shaped by approximately 33,000 employees in 60 countries. Its success is characterised by innovations from entrepreneurial employees. Merck's operating activities come under the umbrella of Merck KGaA, in which the Merck family holds an approximately 70% interest and free shareholders own the remaining approximately 30%. In 1917 the US subsidiary Merck & Co. was expropriated and has been an independent company ever since. Demand for solar panels inside China could explode over the next three years, presenting an opportunity for investors and select international partners, according to a report from GTM Research, the market research arm of Greentech Media. China has a cumulative installed base of 140MW of photovoltaics (PV). By 2012, the report forecasts growth reaching 1.4GW to 2.6GW, driven by new state policies like the Golden Sun program that can cover 50% to 70% of the cost of solar systems, according to the two report authors, China-based Matt Miller and Matthiah Larkin. During the same period, the full price of a solar system installed will drop from US$2.82 in 2009 to US$2.18, lower than in the US or Europe because of lower prices for labor, inverters and other factors. In the West, panels sell for approximately US$2 a watt. In China, a panel now sells for US$1.57 a watt. By 2020, the cumulative installed PV base could grow to 10GW. 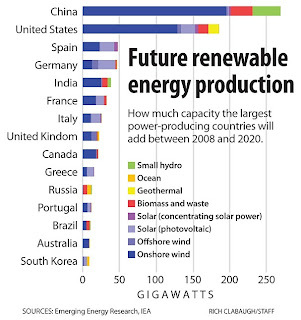 As early as 2007, Chinese industry officials had aimed for 300MW by 2012 and 1.8GW by 2020. The shift to solar could help deflect criticism internationally and more importantly de-escalate ongoing conflicts over coal mining and pollution in various provinces, but the main driver in the shift to solar is a concern over jobs. The country exports more than 95% of its solar panels. The global recession, however, has stoked fears that demand from Spain, Germany and the US could drop. During the same period, the solar manufacturing footprint will grow from 5.6GW of capacity in 2009 to 8.1GW in 2012. In 2005, China had a production capacity of 400MW and a cumulative installed base of 70MW. "Growth is likely to be lumpy and uneven, as bottlenecks will inevitably arise in the project approval and funding disbursement process," states the report. "There are many political layers involved (local government, provincial DRC, NDRC, and the Ministry of Finance, at a minimum), and because application volume will be extremely high."